Middleville, the setting for Megan Rose Gedris' webcomic Meaty Yogurt, is an ordinary town, except for one thing: it's under a curse. Anyone who is born there is destined to die there, after a life of long mediocrity. At least that's what Jackie Monroe thinks, but she's determined to beat the curse and do something extraordinary. When Marilyn "Jackie" Monroe was six years old, her (kind of racist) uncle told her about Middleville's curse. Even as a quasi-adult, Jackie is inclined to believe him. After all, her roommate Saffron studied fashion design, but is perfectly content with her life as a waitress. 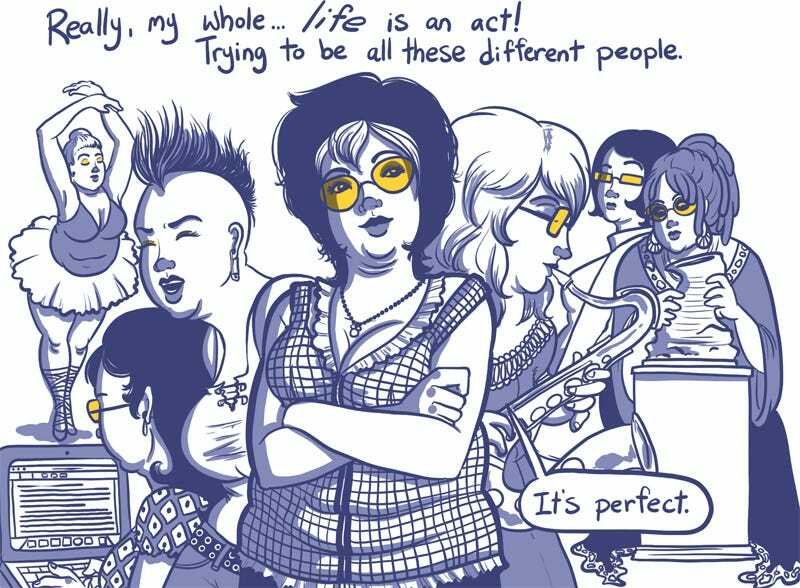 And all the people she finds truly interesting are from out-of-town, particularly Saffron's rock star girlfriend, Moira. Jackie is determined to break the curse, but while she has plenty of ideas and energy, follow-through is not her strong suit. Every week, she has some new plan for achieving greatness — starting a punk band, becoming an actress, learning photography — and each week she abandons it. In fact, the only thing she sticks to are her closest friends, including her long-term boyfriend Tom. It's not clear if the Middleville curse is real or just an unfortunate piece of family lore. But there is something very weird — something not of this Earth — happening at the edges of Meaty Yogurt, something that Jackie is too quick to wave away. After all, nothing that exciting could ever happen in her life, right? It may well be that Jackie only thinks she's living in a slice-of-life comic (with its series of delicious anticlimaxes) when she's living in something else entirely. Whether you'll enjoy Meaty Yogurt depends a great deal on whether you enjoy Jackie. (Note, that's "enjoy" and not "like.") She's a character who wears her warts on her sleeve — she's brash, she's lacks perseverance, and her foot pretty much lives in her mouth. But she's also bursting with life. She's constantly trying new things. She's fiercely protective of her friends. And she'll say just about anything to get what she wants. She is special; she just may not be special in the way she wants to be. We may not always root for Jackie to succeed, but we do always root for her to be interesting. She may well die in Middleville, but that curse may not be such a terrible thing. Gedris has created a number of other webcomics, including the very experimental YU+ME: dream. She also makes Comic Stripper (NSFW), a comic about her experiences as a touring burlesque performer. If you'd like to support her work, throw some money toward her Patreon.